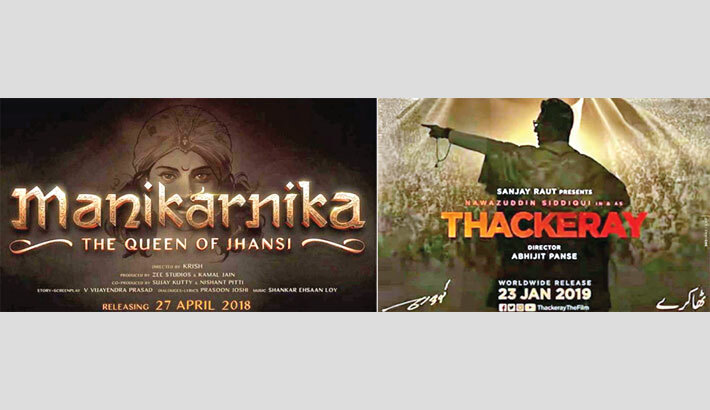 Kangana Ranaut’s Manikarnika: The Queen of Jhansi is set to clash with the Thackeray biopic at the box office of India this weekend, reports Hindustan Times. Starring Nawazuddin Siddiqui in the role of late Shiv Sena founder Bal Thackeray, the film is expected to do well in Maharashtra. Meanwhile, Manikarnika: The Queen of Jhansi seems to cater to much larger audience across India. According to a report in Mumbai Mirror, in honour of Thackeray’s birth anniversary on January 23, the party’s film wing, Bharatiya Chitrapat Sena, has prepared a video of his pictures and famous speeches. Around 250 theatres across the Maharashtra have agreed to play the montage video before the national anthem. According to a PTI report, the makers said that the film will release in 1200-1300 screens in India and 400-500 overseas. They also intend to release the Marathi version in around 400 - 500 screens. Meanwhile, Manikarnika: The Queen Of Jhansi will release in over 50 countries, in Hindi, Tamil and Telugu.